Win Prizes at the Pamper's #BabyGotMoves Twitter Party! Join the @DoubleDutyDivas and Pampers to celebrate your baby's "happy dance" after a restful and dry night's sleep. A dry baby = a happy baby and a happy baby = a happy family. Therefore, when baby wakes up dry, it’s party time! 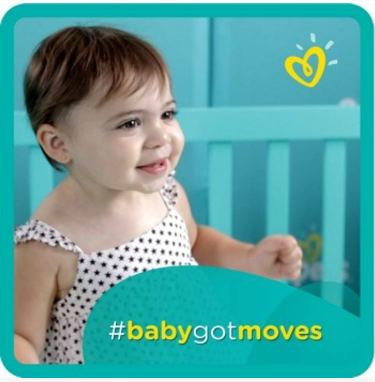 To celebrate, Pampers is asking parents to show off their baby’s morning dance routine by uploading videos to Instagram and Facebook using hashtag #BabyGotMoves. Uploaded videos have the chance to appear in a shareable compilation video created by Pampers that you can view HERE once live on Thursday, to celebrate they are having a Twitter Party! The Twitter Party will take place on Thursday October 2nd at 9pm EST. To participate, follow your hosts @DoubleDutyDivas, @BridgetteLA, @CeceliaMecca @AngieKcom @WhatMommiesNeed @RamblingChick, and the sponsor @Pampers.